bubly — MumbleBee Inc MumbleBee Inc.
Vote for your favorite featured Bubly flavor to play for a chance to win a prize. NO PURCHASE NECESSARY. Open to legal residents of one of the 50 US/DC, 18 or older at the time of participation. Void where prohibited. Sweepstakes begins at 12:00 pm ET on 1/5/19 and ends at 11:59:59 pm ET on 5/31/19. Subject to Official Rules. Physical prizes will be delivered within four (4) to six (6) weeks from time of winner notification. Sponsor: Pepsi-Cola Company, 1111 Westchester Avenue, White Plains, New York 10604.Questions? ©2019 BUBLY and the Bubly Designs are trademarks. 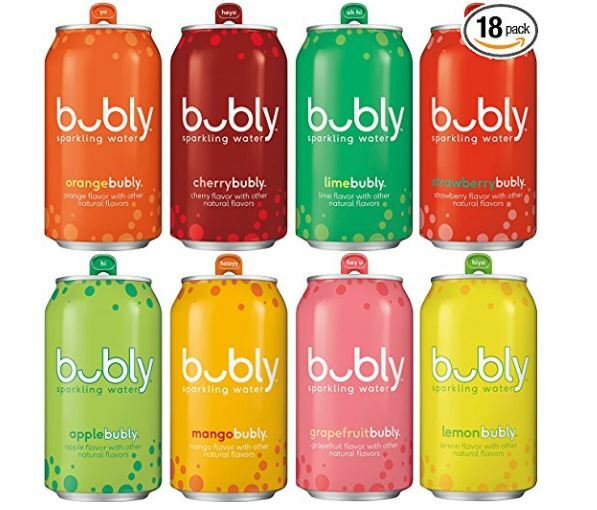 Deal of the Day: Variety Pack bubly Sparkling Water All 8 Flavors for $7.79 for 9/10/2018 only! With Deal: $7.79 ($0.04 / Fl Oz) & FREE Shipping on orders over $25 shipped by Amazon. bubly sparkling water combines refreshing, crisp sparkling water with great tasting, natural flavors perfect for any occasion. Lime, Grapefruit, Mango, Cherry, Strawberry, Orange, Lemon, and Apple.